As in many companies, our main network vendor is Cisco, Inc. and we have a wide device and model variety of their switches, routers and security appliances. Cisco network devices are a large part of our device inventory. Their 'health' has a substantial impact on our network security and availability. Without extra tools, there is no single view on their patch and OS version status. Tools like CiscoWorks can help but are significant work to implement and operate. More importantly, their integration into a 'enterprise', vendor-independend patch and OS version monitoring framework requires extra effort. Here is a description on how to achieve the OS version and patch monitoring by leveraging the existing monitoring tool Nagios. Although it currently works for Cisco, the method is expandable for other vendors. "A textual description of the entity. This value should include the full name and version identification of the system's hardware type, software operating-system, and networking software." (quote SNMPv2-MIB.txt). Not many vendors follow this standard closely by implementing a meaningful version string. Fortunately Cisco is doing it; and for their IOS software it has been done in a consistent way that can be parsed. Thank you Cisco for paying attention to such details! By writing a Nagios plugin we can extract and display the OS version in the monitoring console. Now we have a nice, complete and grouped view on what version is deployed. This mode of the plugin is called the "discovery mode". Although the expectation is that SNMP is already set up on the network devices, here is a quick info on how it might look like for completeness. 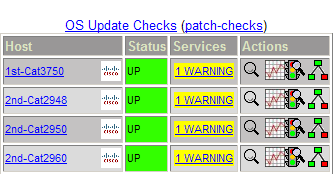 Here we need to configure the check_snmp_patchlevel.cfg IOS version configuration file on the Nagios server. We give th plugin a check by hand before we enable the version lookup with the '-f' option in the Nagios plugin, changing the plugin definition in commands.cfg. Cisco discontinued all of their PIX series, PIX OS goes out of maintenance on July 28th, 2009. All their OS should be marked obsolete by now, highlighting the need for migration.